Welcome to Westmount at Three Fountains Luxury Apartment Homes, the premier luxury apartments in San Antonio, Texas. Our gated community boasts an excellent selection of one, two, and three-bedroom floor plans that provide residents with comfort, convenience, and ample accommodation. When you live in our community, you will enjoy an astounding selection of amenities, which include a well-equipped kitchen with energy efficient appliances, walk-in master closets, and washer and dryer connections. You can even enjoy being surrounded by peace and quiet that sets the perfect atmosphere for relaxation on your private balcony or patio. On those hot summer days, take a dive in our sparkling swimming pool, or host a barbecue in our picnic area. Discover all that we have to offer today, and stop by to say hello to our friendly, professional management staff! Located in the Crown Meadows neighborhood of San Antonio, Westmount at Three Fountains Luxury Apartment Homes is within close proximity of many dining, educational, entertainment, and shopping opportunities. Treat yourself to a night out at any of these local restaurants including The 210 Pizza & Burger Bistro, Umberto’s Italian Grill, and Los Ajos Mexican Grill. 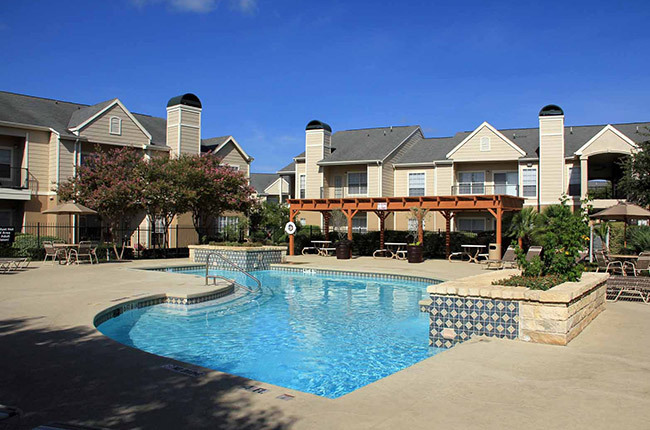 College students that are attending The University of Texas at San Antonio, St. Mary’s University, Texas A&M University-San Antonio, and various other local universities will love the easy commute to campus. When you’re ready to take a break from your daily life, catch a movie at Regal Cinemas or one of the many events that take place at AT&T Center. And don't forget to splurge at your favorite stores, located in Ingram Park Mall, North Star Mall, and South Park Mall! With so much nearby, you will never have to worry about distance. If you are seeking ample convenience, end your search by visiting us today!